In 2012, domestic energy use was responsible for approximately 29% of the final energy consumption in the UK. Research shows that behavioural aspects have a significant effect on domestic energy consumption, together with buildings’ physical characteristics. Buildings’ physical characteristics have been targeted by legislation for decades, but it was mainly during the last few years that occupants’ behaviour started being the object of research, and even more recently of policies and legislation. This article focuses on the behavioural aspects of energy consumption in the domestic sector as well as on demographic characteristics, related to different types of domestic energy users. Occupants’ behaviour is closely related to dwellings’ energy use, but there are mainly two categories of energy use where occupants can make a significant difference. The first is the energy use for computers, appliances and electronics while the second is energy used for for heating or cooling. The former is gaining importance while the latter has always been a main contributor to energy use. According to the report of the Department of Energy and Climate Change (DECC), the percentage of domestic consumption due to consumer electronics and home computing has significantly increased during the past decades. Consumption due to electronics has more than quadrupled since the 1970’s, while home computing almost didn’t exist before 1980. The Energy Saving Trust, in its 2011 report ‘The elephant in the living room’ found that although we use more and more energy efficient appliances, the fact that they are continuously increasing in number means that our energy consumption as a whole increases. Electricity consumption from domestic appliances has actually doubled between 1970 and 2002. Furthermore, between 2005 and 2009, energy consumption due to consumer electronics and home computing has grown by approximately 4% and 17% respectively. Reducing the energy demand for computing and appliances in the domestic sector can contribute towards the UK’s carbon targets; however, this is a complex change which requires both new, more efficient and financially viable products and also a change in consumers’ priorities and decision making. Recent research suggests that since green products often involve greater cost, their promotion needs to be educational. Drawing attention to how individual green consumption makes a difference is a likely means of helping to stimulate green consumption. There are various systems of product labelling in different countries and sectors, aiming to educate and motivate the consumer to make more informed and more energy friendly decisions. For example, the EU energy labelling focuses on energy consumption, while the European Ecolabel is broader and includes more environmental criteria rather than merely energy consumption. The impact of the EU energy labelling has been assessed over the years and it has been identified as one of the most influential instruments in improving energy efficiency in Europe – specifically in the equipment market. However, improvements are continuously proposed in order to maintain the measure’s positive influence on the consumers. Improving comprehension through educational communication has been one of the main suggestions in order to strengthen the labelling’s importance in the market. The second aspect of occupants’ behaviour that strongly influences domestic energy consumption is that of thermal comfort. The decrease of dwellings’ internal temperature by 1.5°C compared to 2007 standards would reduce the UK’s greenhouse gas emissions by 9% and would bring the country closer to its carbon targets. However, this is largely a matter of the occupants’ behaviour and their eagerness to adjust their thermal comfort conditions in order to reduce their energy demand. Wearing an extra jumper or deciding to only heat the rooms of a dwelling that are in use are generally suggested as methods that can easily reduce our thermal energy consumption. Occupants’ financial condition also has a significant influence on their energy use. For example, in households characterised by fuel poverty, it is likely that an energy retrofit would improve the living conditions but not necessarily reduce the energy consumption. People are likely to opt to heat their homes to a higher temperature, rather than to take improvements in savings on utility bills. 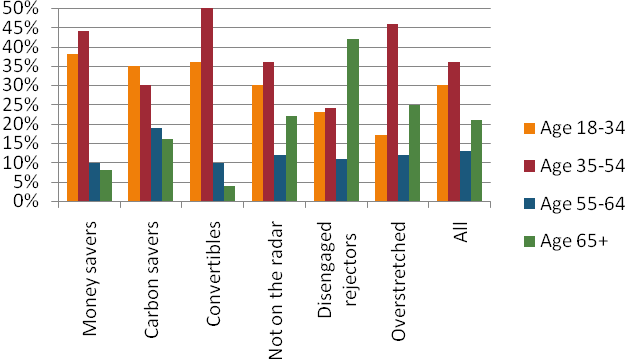 In order to determine some of the drivers of different behaviour research by DECC on the Green Deal segmentation identified characteristics such as age, income and social grade that differed significantly among the groups with different views of energy efficiency. The included graphs summarise some of the most important demographic characteristics of the six categories identified by the research. 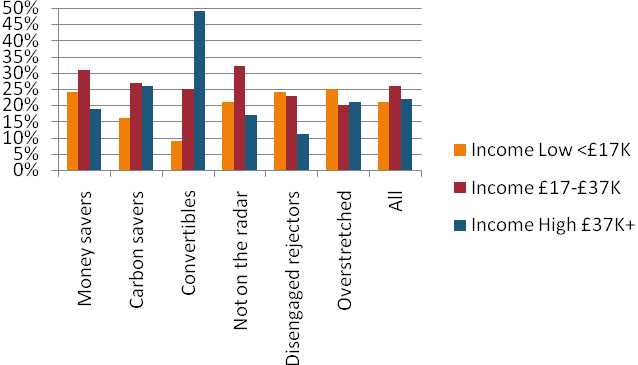 It is evident that in some cases, different segments are characterised by very specific demographics, with one of the most typical examples in this case being the very high income of the ‘Convertibles’ as a group. 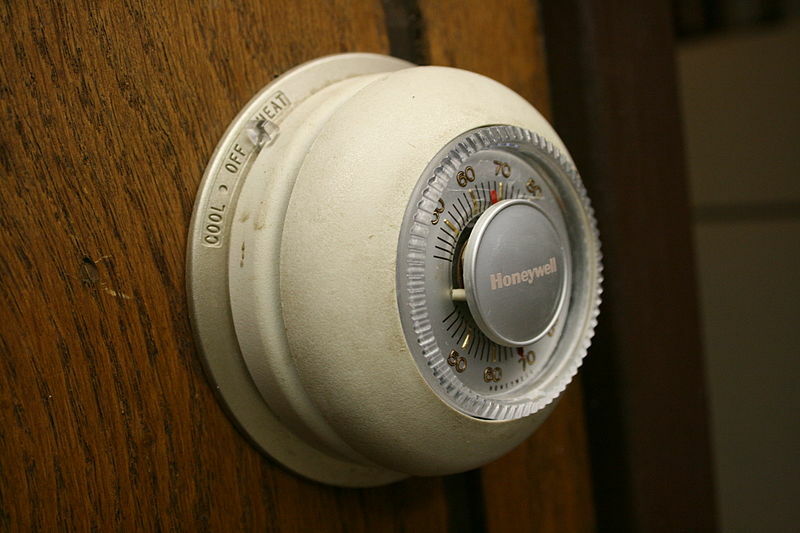 Every demographic group has different behavioural patterns that dictate their energy usage. The data contained in the DECC report helps us to understand how these behaviour patterns change across groups. Further, it provides information useful for developing communication plans that will effectively reach each group. The ultimate aim is to be able to effectively target every demographic group, in order to successfully promote energy efficiency. Additional research and educational campaigning will be required in order to identify and motivate people to reduce their domestic energy consumption through behavioural changes. How Can We Effectively Motivate People to Engage in Sustainable Behaviors?